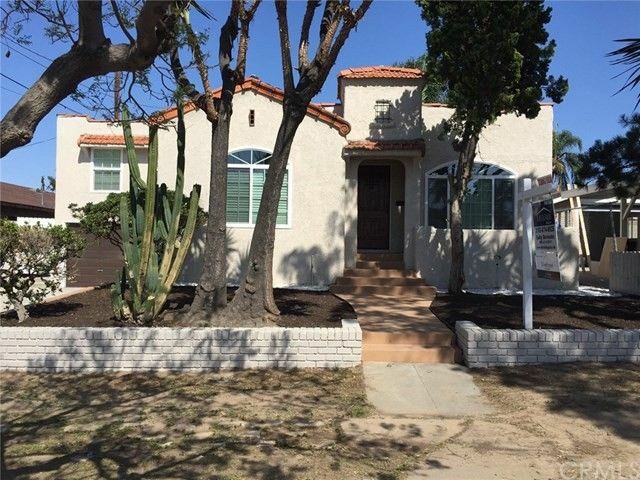 Back on the Market Excellent Income Property for buyers who want to live in one and rent the other AND/OR Investors.This property was completely remodeled and updated in 2016. All work was completed with permits.Amazing Spanish Style Beauty consisting of two houses sitting on a large a lot. Front house is a Wonderful Spanish style Home with 2 large and bright Bedrooms on the upper level and a Master Bedroom downstairs with French Doors leading into the beautiful landscaped back yard. Elegant kitchen cabinets with quartz counter tops and island opening to the living room and dining area, highlighted by two large custom made windows. The back house is a Modern Stylish 1 Bedroom 1 Bathroom unit with which you will fall in love. When you walk in you will experience the airy and bright atmosphere dominated by high ceilings, cozy fireplace and a unique mezzanine level. Both brand new kitchens include new stainless steel stove, dishwasher and hood. All three bathrooms have tiled showers and flooring. You will be amazed by the attention to detail in this Unique Property. Additional features include new energy efficiency double pane windows, new electrical panels, new plumbing, flooring and new roof in front house. Come check out this property...It will not Last! !